The Jieling 27 inch radical adult tennis racquet is the type of racquet that provides you with stability and power. The aluminum body of this product ensures that it durable and sturdy and very hard to break so it can withstand a lot of hard tennis games. It is pre strung and a bag is included with your purchase. It comes in a variety of bright and vibrant colors included green, blue, red and pink so you can easily find something to match your personality and your vibe. The Jieling 27 inch radical racket is made from a combination of Carbon fiber along with aluminum. While this offers you the chance to have a great game with lots of power and stability it is also very lightweight as well as it is still sturdy. It features a comfortable grip and is built to keep your hands cool and dry as it absorbs sweat and prevents skidding of your hand. 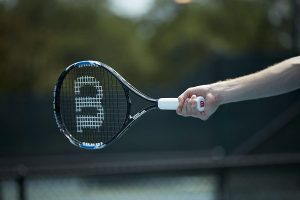 Made from a combination of aluminum and carbon fiber and with seamless connection the racket is stable and powerful while being hard to break and providing a comfortable grip. It is lightweight being made with aluminum and sturdy thanks to its carbon fiber and aluminum combination. Being lightweight it can be swung easily. The grip of the racquet features PVC tape wrapping. This is what is responsible for absorbing the sweat from your gameplay and also helping you to avoid skidding and slippage as well. The racquet is pre strung with polyester string which is said to be more durable than nylon so you know the racket features some strong cords as well. With a 2 point light head balance the racket allows for flexible and precise control of the racket. The racket has a length of 27 inches as is indicated in the title. It also has a head size of 100 square inches and has a grip of 4 1/8 inches with a weight of 330g. The racquet is pre strung with a tension of 50 to 55 pounds with a string pattern of 16 mains and 19 crosses. The swing weight of the racket is 1500 grams and your purchase includes the tennis racket and a carrying bag as well. Tennis is said to be a nobility sport because it started off being played by the French and was later popularized the upper class in Britain. If you want to get on with this nobility sport you will want to get started with a great racquet such as this one from Jieling. The tennis racquet is made form only the best high quality materials right down from the frame to the strings and the grip of the racquet. Its materials ensure that it is lightweight while being sturdy and lightweight and comfortable. It is another of the affordable options for tennis racquets out there. The Jieling 27 inch radical adult tennis racquet compares closely with the Head Ti Instinct Comp Tennis racquet. They are both similar in their price point but the Jieling racquet is a lighter model than the racquet from Head. The grip size, length and head size are all the same but the Head model is just a tad more expensive than the Jieling model. The Head model is made with Graphite while the Jieling model is made with a combination of aluminum and carbon fiber. If money is not an option you can look at a model like the Wilson Juice which offers a better quality tennis racquet and is more ideal for more seasoned players. If you are looking for decent tennis racquet the Jieling 27 inch radical racket is a good option to start off with. It does come at an affordable price and is made from good quality materials. The grip is comfortable and is designed to keep your hands cool and dry during game play by absorbing your sweat. The grip is skid proof so that it will stand strong in your hand and will not slip out easily so you can be sure of a good game. The strings are that so that the racquet can quickly and powerfully snap the ball back to your opponent in the blink of an eye. The racquet truly is a great purchase option and we highly recommend it as it has a number of advantages to using it for your next game. You will definitely love this tennis racquet and you will be satisfied with your purchase once you get out there and get into your first game with the racquet. It is pre strung so you can start playing the day you receive it. wonderful. I really like what you have acquired here, certainly like what you’re stating and the way in which in which you say it.